On The Issues: How Obama Prevailed : It's All Politics The economy wasn't the only issue that voters were concentrating on, and President Obama's message in several other key areas during the debates and in campaign speeches contributed to his victory. 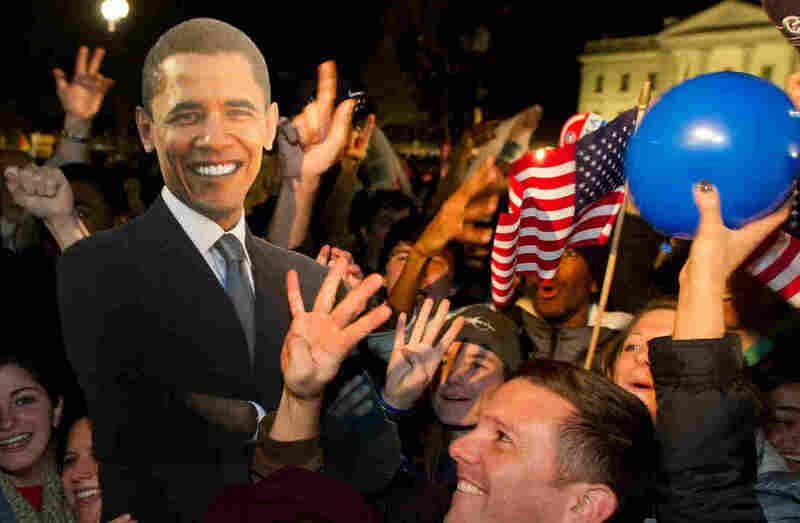 A celebration with cardboard cutout of President Obama in front of the White House early Wednesday morning. President Obama won re-election despite an economy struggling to recover from recession and deep reservations about his signature first-term achievement, the nation's new health care law. As this election year began, candidates and commentators were confident the U.S. economy would be the key issue. But in the end, according to NPR national economics correspondent Marilyn Geewax, this was more specifically an "auto bailout" election rather than a generic economy election. When Obama took office in January 2009, the auto industry was on the verge of financial collapse and he pushed hard for Congress to provide federal support to keep the car companies and their suppliers alive. Mitt Romney opposed such aid, and did so publicly in a New York Times op-ed headlined: "Let Detroit Go Bankrupt." Congress, however, backed the bailout, and the companies rebounded. The president used that victory, and the resulting economic improvements in Michigan and Ohio, to appeal to blue-collar workers in the industrial Midwest and helped lock down his re-election. NPR Pentagon correspondent Tom Bowman says Obama left little or no room for Romney to maneuver against him on national security, and his position as a strong commander in chief clearly helped in his re-election effort. Obama shook the "soft on defense" tag the GOP often assigns to Democrats with several major actions: the killing of Osama bin Laden in a risky raid that accomplished what his predecessor did not; ending the war in Iraq, which polls showed Americans felt was long overdue; and approving a surge of 30,000 troops in Afghanistan. The president also wisely kept on President George W. Bush's defense secretary, Robert Gates, for the first three years, giving him cover with the Republicans when he was able to make cuts in certain defense programs. Despite the October surprise of Superstorm Sandy that brought renewed attention to climate change and energy policy, NPR correspondent Tom Gjelten says there is scant evidence that climate change concerns drove voting decisions in this election. Obama was much less outspoken in his advocacy of green energy and renewable fuel in this campaign than he was in 2008, and his strategy might simply have been to see that energy issues were not decisive. Romney largely framed the debate, promising over and over to achieve North American energy independence by 2020. The president partially neutralized that pitch with his own promise to cut oil imports in half and even indicated he might approve the controversial Keystone pipeline — same as Romney. Given Obama's victory, it seems the energy policy debate was one he could afford to downplay. In 2010 Democrats ran away from the newly passed Affordable Care Act, while Republicans rode its unpopularity, in part, to a takeover of the House. Julie Rovner, who reports on the politics of health care for NPR, says that didn't happen this year. Obama embraced the originally negative "Obamacare" label the GOP gave the health care law, saying he liked the name because, "I do care." In just about every stump speech the president was quick to take credit for many of the popular aspects of the law that have already gone into effect, including allowing young people up to age 26 to stay on their parents' health plans; ending annual and lifetime insurance limits; and requiring insurance companies that spent too much on administration and profits to send refunds to policyholders. The president also turned the tables on the GOP's hits from 2010 on the Medicare cuts in the health law by pointing out that the Republican plan for Medicare would be far more threatening to the long-term viability of the program than any of the changes made by the Affordable Care Act.